From Introduction: "This paper is a guide to the rapidly growing area of research and activity I call 'new commons.' Simply put, new commons (NC) are various types of shared resources that have recently evolved or have been recognized as commons. They are commons without pre-existing rules or clear institutional arrangements. The paper introduces a map that outlines the NC resource sectors and identifies some of the salient questions that this new area of research raises. 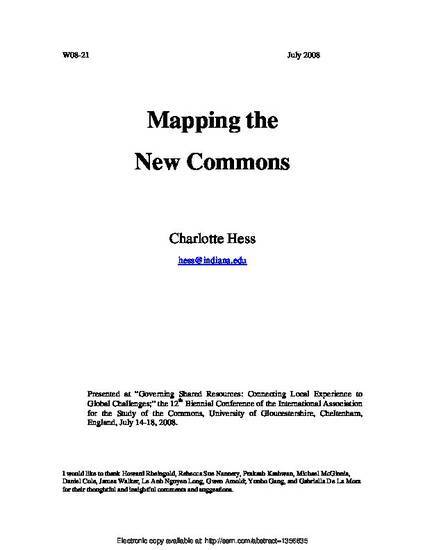 In addition, it examines the relationship between new commons and traditional common-pool resources and common property regimes. "This overview includes a survey of the physical resources, the user communities, the literature, and some of the major collective action activities. Tacking new commons over several years has demonstrated that this vast arena is inhabited by heterogeneous groups from divergent disciplines, political interests, and geographical regions that are increasingly finding the term 'commons' crucial in addressing issues of social dilemmas, degradation, and sustainability of a wide variety of shared resources. The resource sectors include scientific knowledge, voluntary associations, climate change, community gardens, wikipedias, cultural treasures, plant seeds, and the electromagnetic spectrum. All of these new resource sectors and communities require rigorous study and analysis in order to better grasp the institutional nature of these beasts. This map is designed to serve as an introductory reference guide for future scholarly work." Presented at "Governing Shared Resources: Connecting Local Experience to Global Challenges, the Twelfth Biennial Conference of the International Association for the Study of Commons in Cheltenham, England, July 14-18, 2008. Hess, Charlotte. 2008. “Mapping New Commons.” Presented at The Twelfth Biennial Conference of the International Association for the Study of the Commons, Cheltenham, UK, 14-18 July.